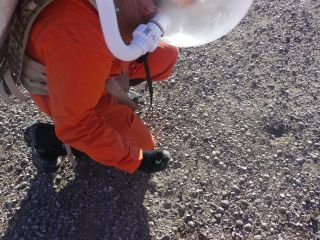 Crew 133 commander Paula Crock bends down to examine some fossilized shells near Utah's Mars Desert Research Station. Staying clean is one of the big challenges after activities outside. HANKSVILLE, UTAH – During an orientation walk around the Mars Desert Research Station in Utah on Jan. 5, our crew confronted a steep hill. Those with hiking experience bounded up the hill like mountain cats. Those less adept (such as me) faced a painful, slippery slide up and down in the mud. It was one of our last activities before going into the full Red Planet "simulation," which includes wearing spacesuits for daily activities. Crew 133 commander Paula Crock during a "Marswalk" near the Mars Desert Research Station in Utah. As with Mars, dust is one of the chief enemies for our University of North Dakota-led crew that is simulating Red Planet exploration. And staying clean in general for Crew 133 is a challenge because, again like crews in space, our water is restricted. A combination of house rules about shoes, and creative showering, helps us keep the mud to a minimum. There are no laundry facilities at MDRS, so one crewmember suggested taking my muddy pair of pants outside and washing it in the snow. (Thankfully, we weren't into the full simulation yet.) This saved on water and got the worst of the brown off the pants, although they still don't look very clean. In fact, most of the clothes I wear get some sort of dust or dirt on them very quickly. Outdoor shoes are prohibited on the top floor of our habitat for obvious reasons. Down below, crewmembers try where they can to keep muddy footwear near the entrances. If we're coming from outside wearing spacesuits, however — something we do for most outdoor activities — it's difficult to bend down to untie our shoes. In those cases, a crewmember waits until the mud dries, and cleans up the mess immediately. Hot water (and water in general) at our facility is limited, and there's no heat in the downstairs bathroom. After a couple of frigid showers, a crewmember bumped up the water heater temperature and found an extra floor heater for the bathroom. That went a long way to making us feel more comfortable. Over the years, crews have also handed down small ideas for feeling as clean as possible: lotions for dry skin, no-rinse body soap for days when you're not using the shower, and ways of airing out clothes in between wearings so that we can reuse them for a day or two.